I was discussing with a friend about my smoothies consumption and he argued that putting them in the fridge to consume them the next day was not good as the vitamin level/effect drops quickly. Does the vitamins' effect drop as quickly as he implies? If so, does putting smoothies in the fridge hasten the effect? 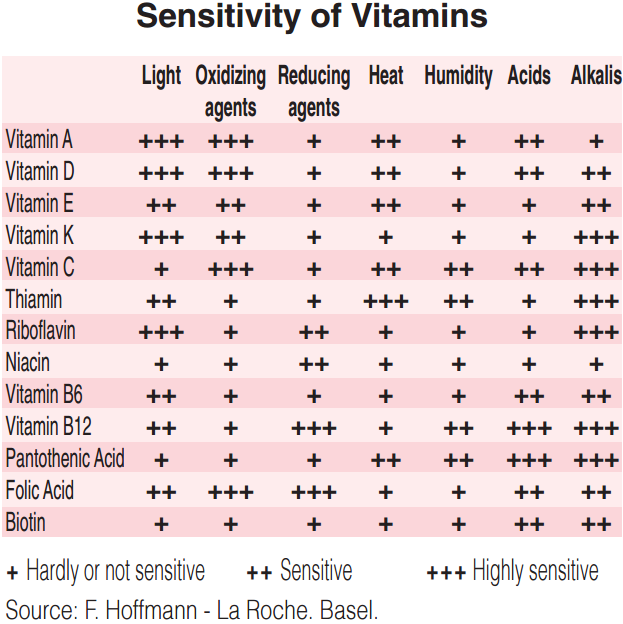 Most vitamins are very stable. Vitamin C can oxidize, a little, over about a week, but overall vitamins are retained in large percentages, over months, even at room temperature. 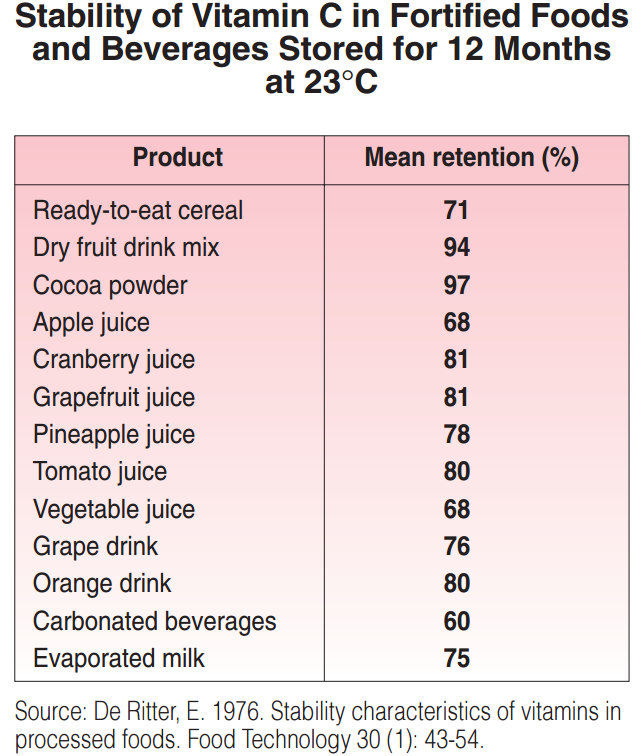 But, as you can see, a large proportion of vitamin C is retained over a year in juices at room temperature. According @Sklivvz' reference, vitamin C is typically the least stable vitamin. 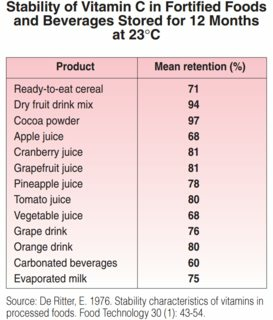 I found a Study on the Kinetics of Vitamin C Degradation in Fresh Strawberry Juices that reports halflife for storage at 8 °C of 4:47 and 5:36 h for juice prepared without and with additional sugar, respectively - I assume that the former number is more relevant for people thinking about healthy nutrition. This means that after 24 h (5 halflifes), you'd expect about 3 % of vitamin C remaining. Degradation is slowed down by cooling (the paper gives kinetics also for 28 °C). Additional "anecdata": This agrees well with a labwork practicum experiment in analytical chemistry I used to supervise where the students consistently found substantial loss of vitamin C in orange juice standing for a few hours at room temp compared to both the freshly prepared juice and juice prepared from peeled orange sectors that were left at room temperature (though I don't have the values at hand). 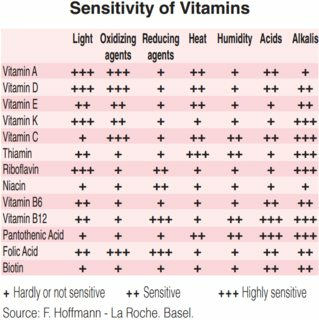 However, I agree with @sklivvz that you don't need to worry too much: while we humans have not much vitamin C storage (compared to say, vitamin D)* getting a bit more and less on alternating days is not going to be a concern. And anyways, eating an additional fresh orange on those days will get you almost your whole DRI. * update: Matissek and Baltes: Lebensmittelchemie, 8th ed, Springer Spektrum lists both vitamin C and D in the 2-4 months reserve capacity (humans) category (table 3.3, p 45). They also state (p. 605) that after destruction of the cell walls, fruits undergo rapid enzymatic degradation, but do not give quantitative information on freshly prepared juices. They explain, however, that fruit juice (in particular the unfiltered varieties ("naturtrüb") usually undergo heat treatment to inactivate enzymes. Not the answer you're looking for? Browse other questions tagged nutrition chemistry vitamins . Ester C, the “better” Vitamin C?